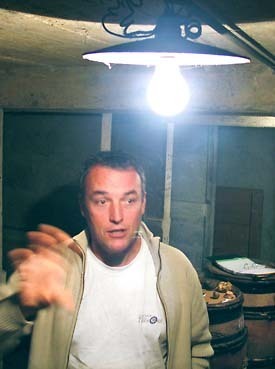 Available vineyard land being a scarce, expensive commodity in Burgundy, Emmanuel Giboulot rents most of the 10 hectares of vineyard he works on. All of it is organically-farmed since 1985, and under biodynamic methods since 1996. His father was a farmer who converted his grain and vegetable farm to organic principles as soon as 1972, which was very rare at the time. his vineyards are scattered on 12 plots (plus 2 generic Burgundy ones) between Hautes Cotes de Nuits reds in the north with "en Grégoire" (Meuilley), "Sous le Mont" (Villers La Fay), to Cotes de Beaune whites (Combe d'Eve, Pierres Blanches, la Grande Chatelaine), then Beaune red (Lulune) near the Pommard valley, Saint Romain red and white, and Rully 1er Cru La Pucelle. The cellar, the chai and the viticulture facility are in three locations, and he splits the different tasks between himself and Pierre Fenals, his only permanent employee, who is in charge with part of the vinification and of the whole of the viticulture side. Emmanuel Giboulot explains that the 28-days cycle of the moon plays a role to bring the wine from its "fruit" stage to its "wine" stage. He says that Jacques Lardière, oenologist at Jadot calls that transition, "la mortification du fruit", in english the death process of the fruit, an utmost important transformation for the future structure and frame of the wine. About the temperature control : no use at all of any cooling system here for the reds. This is not his philosophy. The juice ferments in five 150-year-old open-top foudres, and the temperature goes from the initial 14-15° to 20°C, then up to 30° with the indigenous yeasts activity. His only intervention regarding the temp is to prevent the juice to go down at the end, and he uses for that simple hot water pipes to maintain the juice at 25°C. The chai is an old stone-barn just outside Beaune with lots of natural ventilation, plus they leave the doors wide open on fermentation days [see picture lower left]. Emmanuel Giboulot pours the first wine, a white. His whites are fermented and aged in casks. They still ferment right now, by the way. __1 Bourgogne Blanc 2005. Bottled september 2006. 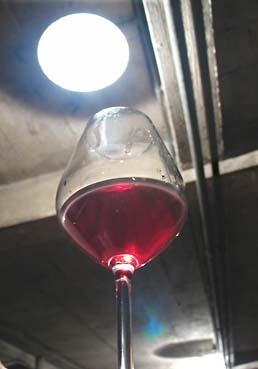 Pinot Beurot (75%), a pink variety actually which is quite rare around here, and Chardonnay (25%). Pinot Beurot used to be planted to replace dead Pinot-Noir vines in the past, with the goal to bring more maturity to the whole P.N. harvest. Nice yellow colour. Refined nose. Richness. Fermented and elevage in several-years-old casks (he stopped using new casks in 2003). He also stopped stirring the lees 7-8 years ago. He wants to put forward the energy of the wine, its verticality. He says that he does not like to consider himself as a non-interventionist, in the sense that he constantly monitors the wine, and listens and watches its every move. The white wine is actually still fermenting now in the casks. __2 Cotes de Beaune "La Grande Chatelaine" 2004. Chardonnay. Clear with green reflections. Freshness. Straight. Floral and pleasant. Emmanuel shows us the plot on a map, it lies on a slope along a wooded hilltop. __4 Bourgogne 2005. Red (Pinot Noir). Bottled september 2006. Very clear and luminous [see picture upper right]. As he is not looking for extraction, the colour of his reds is often clear, he says. Some pepper on the nose. Speaking of filtration, there is nothing systematic in his approach. He used to refuse filtration, but changed his tactics : For long his elevage wines (18 to 20 months) he makes basically no filtration because the turbidity settled down by itself. __5 Saint Romain 2005. Pinot Noir. Bottled september 2006. nose : floral, peony-flower. Underwoods, B. says. Whole cluster here, because the harvest was perfectly ripe (they did it also in 2003). In 2006, they destemmed because the phenolic quality was less advanced. __6 Hautes Cotes de Nuits "Sous le Mont" 2002. Long vinification. Bottled july 2004. One full lunar cycle (28-29 days) of maceration. Nose : Prune, macerated fruits. This cuvée had closed itself after bottling, so they waited a few months to put it on the market. This is a tannic wine with a structure, a wine to eat with. Good with a pot-au-feu, or a bourguignon. Still a young wine. This one was filtrated in spite of its long elevage (he says that it was way too turbid). We now drive with Pierre Fenals to the chai, just outside Beaune. Pierre is working here since the spring of 2004 and his name also shows on the labels now. As said earlier, he is fully in charge of the vineyard management, and he also overlooks the vinification. Being a registered trainer, he also give courses in oenology and viticulture, and he receives students sent by the Beaune wine school. Two traditional horizontal screw-presses (from which they took away the chains to have a softer handling of the must). He says that the problem with pneumatic presses is that you don't get lees anymore with them. And if you make long-elevage wines (18-24 months) like they do here, you need the lees. They also don't press very tight and you can check that when you look at the dried must waiting for the Marc-distillation [see pic on the right] : the flattened grapes are still whole, with most of the grape-seeds still inside the skin. They leave the open-top vats "open" for the fermentation until the juice reaches (and goes lower than) 1000, then they cover the top with a sheet. They do some skin maceration for the reds, some soft pigeage, with the feet on the cap first, then with a "pigeou" [see upper picture]. Some pumping-over sometimes, or some "delestage", when you take out some of the juice and store it 15 minutes in a separate vat where it will naturally cool down a bit, before pumping it back over the top. Pierre drives us to one of the vineyards, La Grande Chatelaine. The Chardonnay vines have now lost most of their leaves. Grass. He plows several times a year, cavaillonage, decavaillonage. He uses a very soft angle for the plow blade to avoid running water. He kneels down to check the earth in his hands : soft and easy to crumble in the hand. Plus, it smells good, he says! With the sun rising on the other side of the hill, the upper part of the plot, against the woods, has sometimes humidity problems, but as he leaves higher foliage than elsewhere, he can cut down the upper leaves if they are sick, and use an organic treatment for the rest. The yields at Giboulot vary depending of the plot and go from 25 to 38 hectoliter/hectare. We walk across several types of wild flowers growing in the grass. We even spot butterflies (and this is october 30th!). He says that specific butterflies go to their own specific flowers. La beauté de votre vigne en dit déja beaucoup sur le vin que vous produisez . Merci de votre action contre les traitements pesticides insalubres . Just a word to say that Mr Giboulot is unfortunately facing a trial on the 24 February, because he refused to spread pesticide on his own vines! He is supported by many people, including me. I also support you Mr. giboulot, I use teetree oil mixed with half water and half alcohol to spry my lemon trees and orange trees and it is very effective on the endemic disease of citric leaves. I hope you find the right natural means of treating your vineyards.